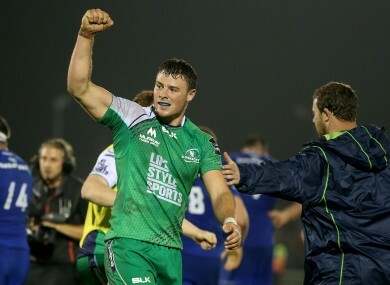 Outside centre Robbie Henshaw celebrates the win over Leinster earlier this season. IT MAY SEEM a little early in the season to be calling a clash with Treviso vital, but Connacht’s fixture at Stadio Monigo this evening [KO 19.00 Irish time] is exactly the type of game the province must win if they are to achieve their goal of a top six finish in the Pro12. The meeting between the sides in Italy in October of last year saw Pat Lam’s men limp to a 23-3 defeat. However, with Treviso having lost all five of their games so far in the current campaign, four points look a must this time around. Lam and his captain John Muldoon have happily accepted that they are putting pressure on themselves this season by stating a defined target, but the circumstances have demanded it. Connacht are not quite the ignored sibling in the IRFU family any longer. While the funding Connacht receive is still not no match for that provided to Ulster, Munster and Leinster, there has been an increase in IRFU backing for the westerners recently. The IRFU, to be fair, over the last number of years have supported Connacht pretty well,” says manager Tim Allnutt, a captain of the province during his playing days. “I think Connacht were probably pretty good for a time at going up to Dublin looking for things. I think over the last few years, with our Professional Game Board in place and with the way that we’ve been going, we’ve had to stand up and grow up a little bit. Confirming the IRFU’s increased support for Connacht in numerical terms is no easy task, but the province are holding up their end of the deal comfortably at present. Robbie Henshaw and Kieran Marmion were capped by Ireland last season, while other academy products like 22-year-old Jack Carty, 21-year-old Darragh Leader and 23-year-old Mick Kearney are all playing first-team rugby. “Our academy has been doing well and producing quite a few players,” agrees ex-centre Allnutt. “I would say that part of the strength of our academy is that they actually get game time at the top level, and consistent game time. Along with that crop of youthful native talent, Lam has been able to secure the services of high-profile Kiwi players like Craig Clarke [unfortunately now retired], Mils Muliaina, Bundee Aki and Tom McCartney. In terms of future recruitment, Connacht could even make the case to the best youngsters in Ireland that they are better off in Galway, where precious game time is more achievable at a younger age. That 20-year-old Leinster underage product Shane Delahunt makes his first start for the province this evening, in the same week that he signed an academy contract, is the latest proof of that. “We want players to be able to look at Connacht and think ‘that’s a place I could go to,’” says Allnutt. “If they’re not from Connacht, and coming in from other provinces, they can come in, develop and get selected for Ireland. I think the systems that we have in place are pretty strong now, we’ve improved in all areas. It goes back to the extra funding from the IRFU. Those improvements off the field have led to a promising start to the Pro12 season, but the pressure is on Connacht to maintain their current fifth position in the league table right through to the conclusion of the campaign. The next step in that process is a win over Treviso in Italy. Connacht: Darragh Leader; Niyi Adeolokun, Robbie Henshaw, Craig Ronaldson, Matt Healy; Jack Carty, Kieran Marmion; Denis Buckley, Shane Delahunt, Rodney Ah You; Mick Kearney, Quinn Roux; John Muldoon (capt. ), Eoin McKeon, George Naoupu. Replacements: Dave Heffernan, Ronan Loughney, Finlay Bealham, Aly Muldowney, Willie Faloon, Ian Porter, Dave McSharry, Danie Poolman. Treviso: Jayden Hayward; Ludovico Nitoglia, Luca Morisi, Enrico Bacchin, Michele Campagnaro; Sam Christie, Edoardo Gori; Matteo Zanusso, Davide Giazzon, Rupert Harden; Marco Fuser, Corniel Van Zyl (capt. ); Simone Favaro, Alessandro Zanni, Mat Luamanu. Replacements: Amar Kudin, Albert Anae, Romulo Acosta, Antonio Pavanello, Tomas Vallejos Cinalli, Francesco Minto, Simone Ragusi, Alberto Lucchese. Email “Academy-inspired Connacht looking to keep up their side of the IRFU bargain”. Feedback on “Academy-inspired Connacht looking to keep up their side of the IRFU bargain”.